LSU beat writer Glenn Guilbeau brings you insight into the Tigers as do The Times sports writers. Read all things LSU every day. Well, well, well. It looks like the NCAA is going to do some snooping around Thiboduax. Foxsports.com is reporting that NCAA investigators have interviewed "several people in Thibodaux about the recruitment of Trovon Reed last year and Greg Robinson this year. In Auburn's defense, there is a chance that both players could have been signed on the up-and-up. That would require Reed having signed last year without any problems and Robinson could have followed his friend. However, the cynics that are out there -- and there are many -- are wondering exactly how in the world you get from Thibodaux, Louisiana, to Auburn, Alabama? It could get interesting for Aubie this offseason. Signee Johnny O'Bryant was chosen Thursday to play in the McDonald's All-American game. That's right, LSU has a McDonald's All-American on the way. And it's been a long time since the Tigers could say that. 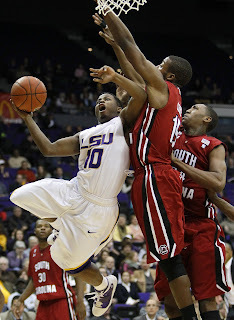 O'Bryant is a 6-foot-10 power foward who is ranked as the No. 30 player in the nation by ESPNU. There is little doubt that Trent Johnson expects to pencil O'Bryant into the staring lineup next season. You can check out O'Bryant for yourself in the McDonald's game from Chicago on March 30 on ESPN's family of networks. On the bright side, LSU was in the game with Ole Miss with a chance to actually pull off a road win. That's major improvement over where the team was a couple of weeks ago. 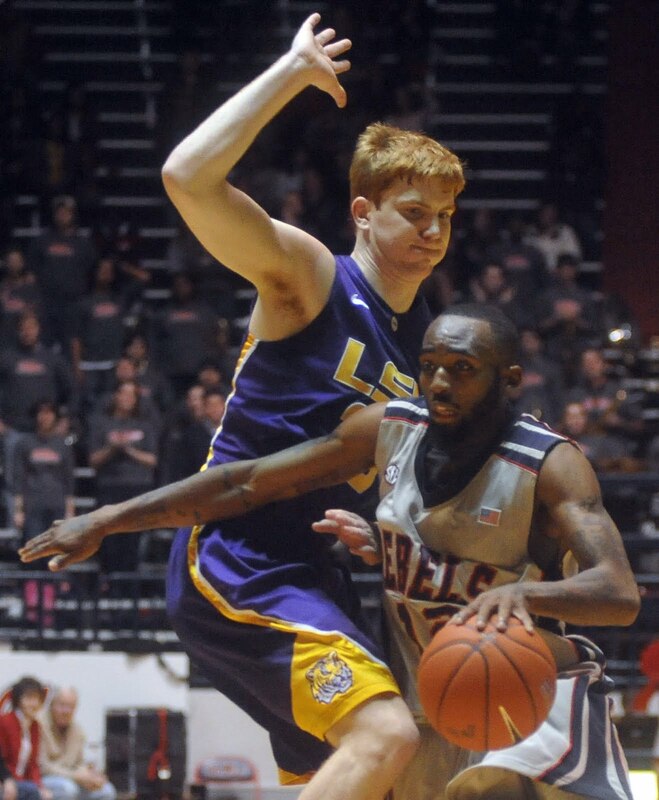 That's one way of looking at LSU's 66-60 loss at Ole Miss on Wednesday. Another way of looking at it is the Tigers have Ralston Turner and Storm Warren back from injury and STILL CAN'T WIN. 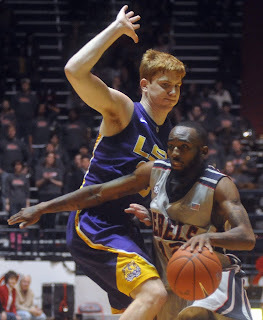 Ole Miss made more free throws than LSU shot in the game. 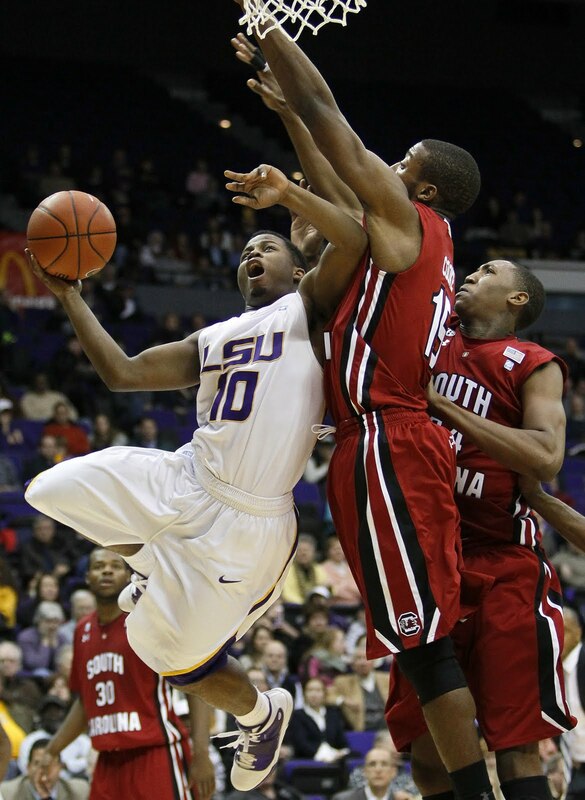 And, for LSU, the Tigers were a respectable 45 percent shooting from the field but only 6 of 12 at the line. Looks like another losing season and an early exit from the SEC tourney for this bunch. Just like football is mostly about blocking and tackling, basketball is mostly about shooting and defending. So it's never a good sign when your team is last in the league in shooting. Meet the LSU Tigers. Last in the SEC in scoring offense. Tied with Auburn for last in field goal percentage at .397. It's not a good problem to have going to Ole Miss on Wednesday. If LSU doesn't win the national football championship next year, then it probably won't be because the Tigers didn't start high enough in the polls. I was listening to XM Radio on the way into work and caught Phil Steele on the Rivals Radio show. He was asked about what the AP preseason top would look like. Steele predicts Oklahoma will be the AP preseason No. 1. And at No. 2, he said he thinks it will be either LSU or Alabama. Not a bad place to start in 2011. OK, here are few tidbits as we go down the stretch. 1) You can take Philadelphia, Miss., linebacker C.J. Johnson off your LSU target list. He committed to Ole Miss today per the Jackson Clarion Ledger. 2) Evangel defensive end Jermauria Rasco will visit Florida this weekend. The Gators didn't really get into the picture until Will Muschamp got there. LSU and Florida State are other bigger players there. 3) It's looking more and more like defensive lineman Tim Jernigan will stay in his home state of Florida with Florida State being his likely choices. LSU has been a player in the Jernigan recruiting process. 4) Georgia defensive lineman Ray Drew appears to be headed to Georgia with LSU something of a long shot on that one. So looks like ESPN's wrong again -- you may remember yesterday's report that Les Miles would go to Michigan if offered the job. OK, I guess there is the chance in a five-hour meeting that he wasn't offered the job, but I'd put the odds against that. No matter what one thinks of Miles, the timing of this situation would have been brutal for LSU. There is no one out there that is available and better. Will Cotton Bowl be Miles' last game at LSU?